This lovely walk is just a little over 8 miles with only one stile and a few gentle inclines. The countryside is glorious and the walk takes you through open countryside, along riverside and through woodland with a short section along quiet country lanes. Suitable for dogs. The walk incorporates sections of the Millennium Way, where you will be guided by the distinctive black Millennium Way way markers. Find out more about the walk by clicking on the information icon. Park in the car park off Bell Lane, Studley - entrance is just opposite Bell Mead. Exit the car park turning right to reach the T-junction. Go directly across road to walk between the bollards and continue ahead along road between houses. At the end of the road ( cul-de-sac ) go left to enter a narrow passageway between wooden fence and hedge. Emerging from the passageway take the wooden kissing gate on right then go ahead following river on left. Shortly the river bends sharp left. 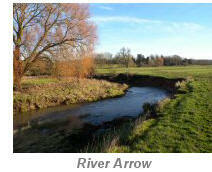 Continue towards the church and take the footbridge across the River Arrow. Go through a kissing gate to a lane. Go left for a few paces then turn right into the churchyard. The attractive Church of The Nativity of the Blessed Virgin Mary was built in 1105. Go right past the front door of the church and cross churchyard diagonally to exit by wooden gate to lane. Ignore footpath opposite, and instead go left on lane then take metal gate 40 metres ahead where you will note that you have joined the Arden Way. Continue along wide grassy track between hedges. Shortly the track narrows and continues gently uphill (at this point there is a well marked major diversion around the Studley Castle Marketing Centre Site which is being redeveloped - please follow the appropriate temporary signs through metal gates eventually to emerge on original route, just before the greenhouses). Go right, past greenhouses and stay ahead on track to pass Wig House on right. Continue along and immediately after passing under power lines take metal gate on right into field and walk parallel to the power lines crossing diagonally over field. Exit field by metal gate to track then go right to continue along track. After a short while, the track veers to the right by a way post. Leave the track here and continue ahead on the Arden Way with hedge left. Stay ahead to take metal gate into next field and go slightly right walking beneath power lines to exit into next field via small metal gate at corner of a wood. Continue gently uphill alongside power lines keeping wood on right. At the brow of the hill continue on to take next metal gate ahead. Stay forward keeping close to hedge right. Ignore two gaps right and approx 30m before field corner take two metal gates on right (hidden in hedge) into another field. Go diagonally 1/2 right to walk diagonally across field between a line of four large trees finding a small metal gate to exit field. Stay forward to take a kissing gate into next field. Go left along edge of field keeping fence and hedge left to eventually take a kissing gate at top of field. Go right after the gate keeping hedge right and heading up towards building ahead. 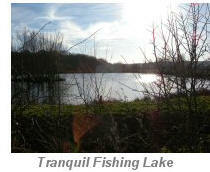 Here you will pass an attractive fishing lake on your right. Take the corner kissing gate into Manor Farm and almost immediately take further waymarked kissing gate to cross paddock area diagonally and exit at top corner just in front of a modern style farmhouse. Stay ahead to take kissing gate to lane and stay forward passing the house ( Spring Cottage ) on your left to reach road. Turn right on road to pass Morton Bagot Manor on right. Stay on lane initially passing Orchard House for about 1/3rd mile to reach a road junction. Turn right at road junction and when you reach the crossroads continue over in the direction of Shelfield and Wootton Wawen eventually to pass under power lines. As the lane gently rises, go past a way marked footpath on left and continue gently uphill shortly to find a way marked metal gate on right. At this point we join the Millennium Way and share this part of the route with both the Arden Way and the Heart of England Way. ( From here you will be guided by the distinctive black Millennium Way way markers). Once though the gate go 1/2 left through small copse and then emerging into field turn right. Go uphill along field edge with hedge right. The path gets gradually steeper but soon flattens out. At the top of the rise take gap right to go over stile and then immediately turn left to follow with fence left to take gate into Bannam's Wood. Follow the path as it winds ahead through the attractive wood. 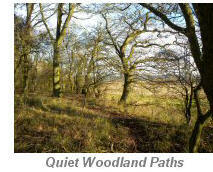 The path through the wood is marked in various places with way posts, but the footpath is easy to follow. The woodland path gradually winds downhill veering left on a rough track to reach a gate to the road. Here we leave the Arden Way & Heart of England Way and turn right up the road to continue on the Millennium Way. Where the wood ends continue along road to pass under power lines and keep a sharp look out for a waymarked gate hidden in hedge on left. Take gate and continue along edge of field with hedge right. At the field corner take metal gate then go diagonally 1/2 left across next field to exit via wooden gate. Go right on wide grassy way parallel with power lines on far left and stay forward to brow of hill ahead. At the brow go down slope to the bottom to take gap left adjacent to start of hedge. Go ahead with hedge right to exit field via corner gap then continue with hedge right to exit next field via corner gap. Go diagonally 1/2 left to field edge by a small transformer fixed to an electricity post close to large metal barn. Proceed slightly left down grassy track towards pylon past house with skylights and entrance to a private driveway ( often with barking dogs which are securely contained within garden) to find large pylon with overhead cables. When you draw level with large pylon do not continue to road, but go right between wooden fence and hedge right to find metal gate. Take gate and cross driveway to take further gate. Go ahead, eventually to pass under power lines, and past a solitary waypost to far corner, and through passage to find metal gate. Take gate (and here we leave the Millennium Way) and go diagonally 1/2 right to pass between two large trees then through a narrow corner gap. Continue on with wire fence and stream on your right. At the field corner take metal kissing gate and go right down track. After a few yards you will notice on your far right a building known as Studley Castle but which in fact is a hotel / conference centre. Stay on the track which eventually swings right in front of a hedge to a large gap on left. Take gap and go forward to follow yellow waymarker directly ahead - the footpath here can be a little vague but usually discernible as it rises very gently to a brow where you pass a couple of trees and small low-lying pond (heavily overgrown with reeds) on your right. Continue past the pond and the path gently descends to a gap next to a partially hidden fence post with solitary waymarker pointing towards a narrow gap. Take the very narrow gap and continue along this narrow path with hedge left and wire fence right. Stay along path to take wooden gate into graveyard and exit by another gate to lane. Go left on lane following round right at the corner to continue past the church on your right. Stay on lane to reach a road junction. Go left on Hardwick Lane and a little way ahead where the lane turns sharp left go straight on through a metal kissing gate and take the left hand path going diagonally 1/2 left across field. (Here you are crossing the remains of an old priory and will notice the typical ridge and furrow topography). Take the metal kissing gate in the field corner and stay diagonally 1/2 left across next field eventually meeting and continuing to follow the River Arrow on your left. Shortly we need to take the metal kissing gate left and the footbridge across the river now walking along a fenced path with river right. The path soon swings sharp left and continues with tall hedge on left to reach a kissing gate. 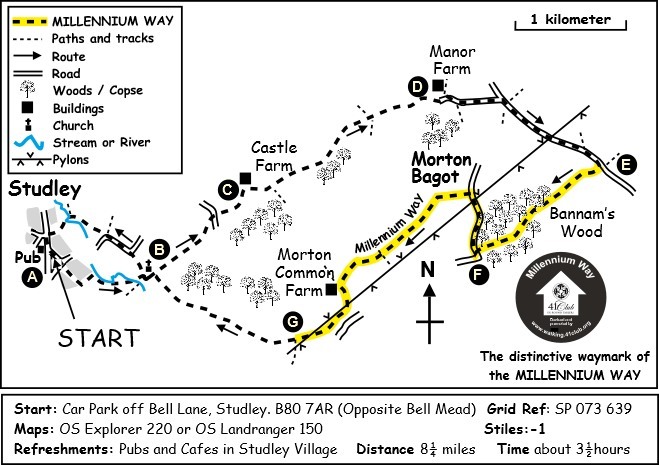 Take gate to reach surfaced track and go right to reach the main road in Studley opposite the Barley Mow pub, which is an option for refreshment. Turn left along main road which soon brings you back to your starting point in Bell Lane. 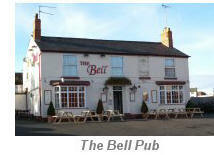 The Bell Inn opposite is another choice for refreshment. A large village with rather more than the average number of pubs per head of population (17 within 1 sq. 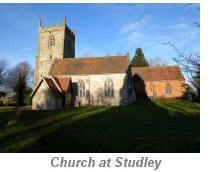 mile), Studley is also known for being the site of a sewing needle and surgical needle making industry. This specialisation started when Elizabeth I permitted a number of Huguenot refugees to settle here, bringing this rare craft with them. Studley became a leading area in this craft, gaining a European and even worldwide reputation. One of the streets in the village is named "Crooks Lane", ostensibly because the crooked needles from the original factory were dumped at the end of this lane. An Augustinian Priory was founded here in the 12th century, but dissolved by Henry VIII. 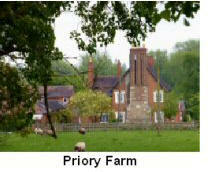 Some fragments of the original medieval stones are incorporated into Priory Farm, which is passed early in the walk. The parish church of The Nativity of the Blessed Virgin has fine surviving examples of opus spicatum or herringbone masonry and a medieval rood screen. A 16th century house called Old Studley Castle, which can be seen behind the parish church, occupies the original medieval castle site. 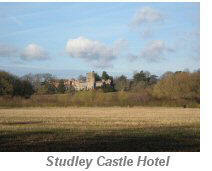 Studley Castle was never a castle, but a Gothic Revival mansion built in 1836 for Francis Holyoake. It is now a hotel. Bannam's Wood is a SSSI, important for its invertebrates (264 varieties of moth recorded). 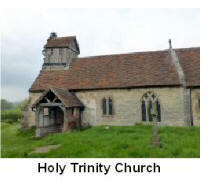 Although a slight diversion from the Millenium Way, the charming church of Holy Trinity is worth a look. John Burman, in ‘Warwickshire People and Places’ noted that the church was lit by candles and this is still true today giving Winter services a very individual spiritual feeling. Behind the church there are earthworks which are believed to be the site of a castle or fortified manor house. The size and depth of the earthworks suggests that this may be a small ring-motte.